Differential single phase 2 poles (1 + N) 63A 0.03A (30mA) class AC. Electromagnetic element, which allows you not to lose protection in case of variation in the voltage input and thus to maintain the protection of the active phase in case of loss of the neutral. Electrical differential protection switch 63A 30 mA, 2-pole, electromagnetic type, for protection of people against insulation / derivation problems in installations or electrical elements. For use in domestic, tertiary and industrial sectors. Class of employment "AC" standard. This type of differential is of electromagnetic operation, which allows not to lose the safety function in case of voltage supply variations or loss of the neutral conductor, only with the derivation in the active phase the tripping of the differential takes place. 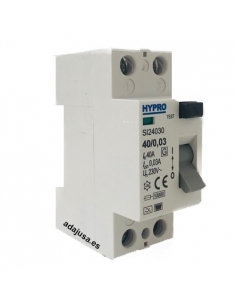 Being electromechanical it provides a wide range of operating voltage (typical between 6 and 240V), which implies a high degree of immunity against variations in the input voltage, and likewise, the safety function is not lost before the power failure in the neutral. Number of poles: 2 (1 Pin + Neutral). For more information about the electrical differential you can download the technical data sheet by clicking on the "downloads" tab.